Unveiled as part of an online Apple Store update ahead of the March 25 event, the 2019 iPad Air takes on the same general external form as the previous version, but with that larger screen. A major change to the iPad in this generation, the switch is from the standard 9.7-inch display to a 10.5-inch version. The LED-backlit display is a fully-laminated panel with support for True Tone and P3 wide color gamut, and a resolution of 2,224 by 1,668, giving it a pixel density of 264ppi. Offering 500 nits of brightness, it also has anti-reflective and oleophobic coatings. The seventh-generation devices start from $499 for the 64-gigabyte WiFi version, rising to $629 for the WiFi + Cellular iteration. A 256-gigabyte configuration is also available. Keeping largely to the same design also involves retaining Touch ID for biometric authentication, instead of switching it for Face ID. Also staying the same is physical connectivity for charging and data, which has stuck with Lightning for the moment rather than moving to USB-C, a shift the iPad Pro range has also made. Apple has also elected to keep the 3.5-millimeter headphone jack in the model, making it an unusual item in Apple's product lineup. The headphone jack has slowly been disappearing from Apple's mobile ecosystem, with it no longer available on iPhones since 2016 and being removed from the iPad Pro in 2018. 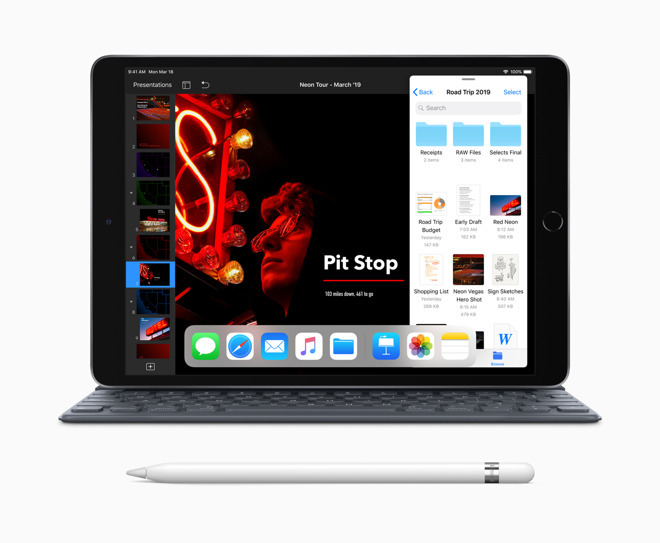 The main change for the 2019 iPad Air is performance, with Apple upgrading from the A10 Fusion to the A12 Bionic, with its 64-bit architecture, Neural Engine, and embedded M12 coprocessor. The ability to use the Apple Pencil makes a reappearance, after being introduced last year. For this model, the stylus supports the first-generation Apple Pencil rather than the second-generation release. The cameras remain unchanged on the iPad, consisting of a rear 8-megapixel shooter capable of 1080p video capture, as well as a front-facing 7-megapixel FaceTime HD camera. Battery life is claimed to last for around 10 hours of usage, in line with the usage time for the last two models. Customers can order the 2019 iPad Air today in a choice of silver, gold, and space gray finishes, and is expected to start arriving in stores and being delivered to customers later this week.